Pencarnan is 96 acre working farm extending to the high water mark on Porthsele beach. 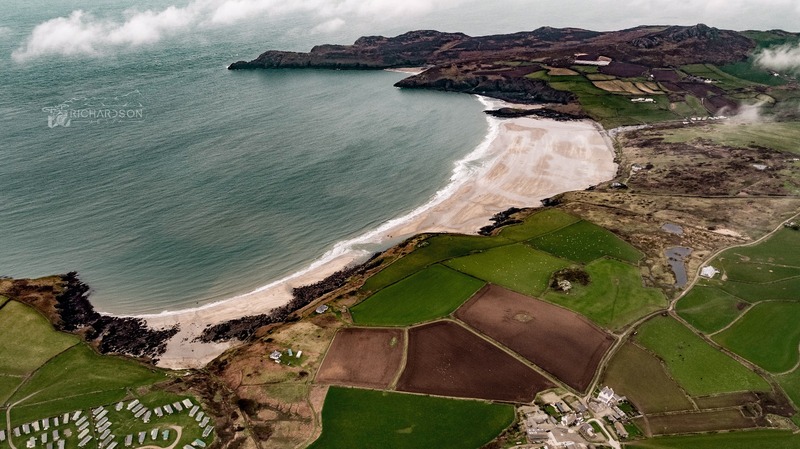 We are situated on the most westerly point of Pembrokeshire looking out toward St Georges Channel which connects with the Irish sea to the north and the Celtic Sea to the south. The campsite part of the farm began around 1956. My parents were tenants here before they bought the farm, my father was born at Pencarnan in 1915. Most of our campers have come to us from word of mouth recommendation since it all began back in the 50’s….and some of the ‘original’ campers are still visiting with their children and grandchildren. If you are looking for a bit of the wild life, or a wild life even, and love the outdoors then Pencarnan is for you. When the wind blows it sure does blow and what we consider a slight breeze if often deemed to be ‘very windy’ by many visiting for the first time. When is rains it often comes down sideways driven off the sea by the wind with some force. But the up side to this is that the weather fronts move away quickly and when the sun shines and the sea is however you like it, this corner of Pembrokeshire is the most amazing place to live and play in. The static caravans fields and two of the camping fields overlook Whitesands bay and there are two other camping fields set back away from the bay view with view towards Ramsey Island.